Riding for Alex Carone on the road to Las Vegas. It’s a song I’ve loved for years though I never had a clue that it wasn’t Nevada he was singing about but that town a few hours from Albuquerque. And not too far from the Conchas-Pecos branch of the legendary Singleton Ranches where there is, indeed, an Alex Carone working as a manager. In the second-hand stores near the plaza in Las Vegas, there were saddles, some of them broken-down and cracked, some of them in pretty good shape. I saw a bridle with silver conchas and many pairs of cowboy boots. There were paint ponies in a field on the way to Montezuma. You could smell history in the air, though maybe not everybody’s history. Not mine, I know, but that didn’t prevent the yearning. Today I’m putting away my suitcase, the books I bought, and catching up with work at my desk. 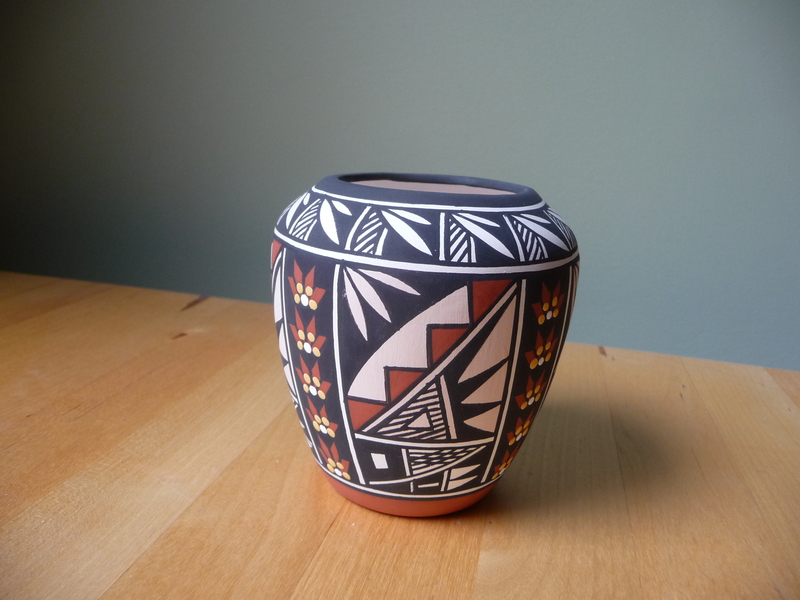 I took a moment to photograph the little Acoma rain pot that I bought from its maker, Emil Chino, at the Sky City Mesa. It stood out on the table he presided over — a few big ollas, some seed pots, and an assortment of the rain pots. I wish I could read the imagery a little more fluently but I remember Emil pointed out the rain, the clouds, some ears of corn. And for now, that will have to do. ~ by theresakishkan on April 23, 2014. Stunning clarity of design, very modern. Past+present so neatly rolled into one. Lucky you! It’s really lovely, Andrea. And so different from some of the other Pueblo styles — the incised blackware at San Ildefonso, the melon pots, etc. This little pot made it home safely by being wrapped in my Cowichan tuque! This entry was posted on April 23, 2014 at 8:21 pm and is filed under Uncategorized.You can follow any responses to this entry through the RSS 2.0 feed.You can leave a response, or trackback from your own site.